Ecstatic. That was my first reaction when I heard the news – possibly 6 or more inches of snow headed our way!!! That is epic in the Central Piedmont region of North Carolina. My excitement quickly started to fade when I remembered my 120+ daffodil bulbs that are beginning to poke through the soil in what I’m trying to establish as a cutting garden. Back in November I planted the daffodil bulbs, in addition to 75 crocus bulbs, 25 Asiatic lily bulbs, and two peony tubers. As an aside, I probably should NOT have done this a few days before being a bridesmaid in my best friend’s wedding, but all was forgiven (fortunately, she loves flowers too). You can imagine my excitement when the crocus started to bloom toward the end of January. This is also when I noticed the daffodils starting to come up. 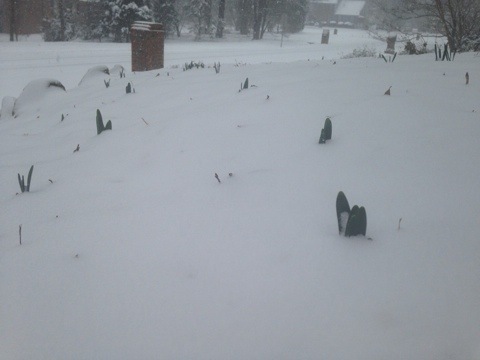 I had a patch of daffodils when we lived in Virginia, but they typically didn’t emerge until March. This is the earliest I’ve experienced – I guess moving four hours south makes a significant difference! 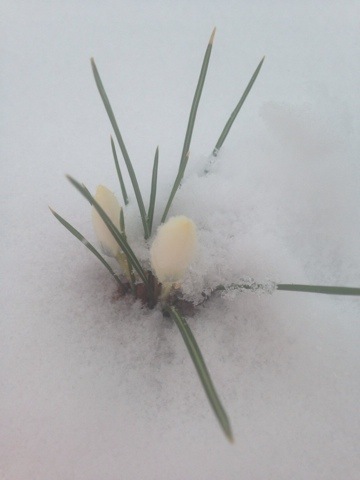 Back to the snow… I did some research and feel some relief after reading that daffodils are quite hardy in snow and can survive temperatures down to 10 degrees. With this knowledge, my plan is to leave them uncovered and hope for the best while enjoying the snow!